This savoury jam with caramelised onions is an absolute treat. Use it in sandwiches, burgers, salads or dips and it will instantly add a boost of flavours. 1.1. Heat oil and butter in a heavy bottomed pan. Add chilli flakes and herbs and cook for 2 minutes until fragrant. 2.2. Throw in the onions, and cook on a low flame for 15 minutes. Once they soften and become translucent, increase the flame to medium, cook for another 10-12 minutes or until they start to turn golden brown. 3.3. Add brown sugar, salt, pepper and balsamic vinegar and cook for another 10-15 minutes on a low flame, stirring frequently. Cook until all the water has evaporated and the onions are sticky and dark brown in colour. Remove from the flame. 4.4. Once cooled, discard the rosemary sprigs. Transfer to a clean and sterilised glass jar. 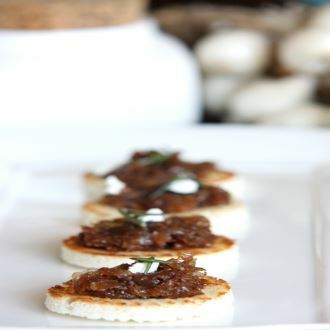 5.Tip:This onion jam should be stored in the refrigerated and consumed within a month. It can be used in wraps, sandwiches, pizzas or add a spoonful of the jam to mayo to make a delicious caramelised onion dip.